A Photo is viral showing a girl pulling a rickshaw with rickshaw owner sitting in it. 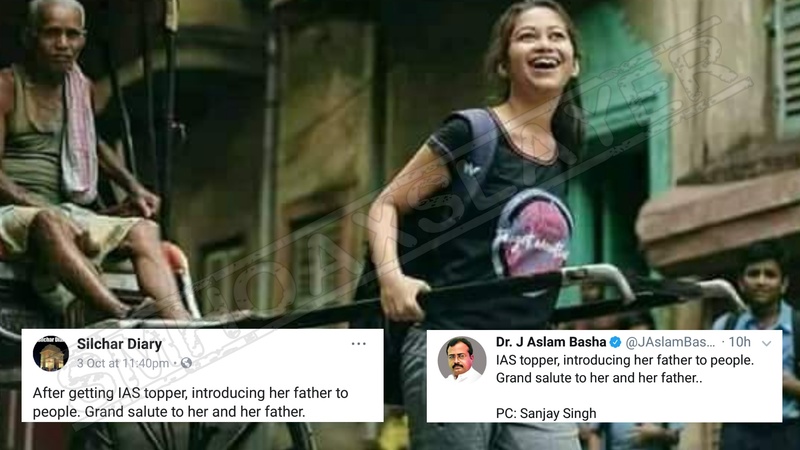 The texts along with the images claims the girl to be an IAS topper and the man in rickshaw as her father. “IAS topper, introducing her father to people. Grand salute to her and her father..
After getting IAS topper, introducing her father to people. Grand salute to her and her father. Part time adult. Full time hungry. Sunset lover. Over thinker. Story teller. So here goes the story behind this. Since childhood, whenever I used to visit the north and central part of Calcutta essentially, I would feel sympathetic everytime I would spot a hand pulled rickshaw, thereby choosing not to use them. Until recently when my sympathy coincided with the realization that we’re helping to earn their bread and butter only when we’re taking a ride. So last time I was in Calcutta, the #wildcraftwildling in me decided to pull a handpull rickshaw instead, to see how difficult and strenuous it really is. I asked the rickshaw uncle to have a seat while I pulled him around on the streets of Shobhabazar, tickling the bell at intervals while the whole street stood and watched in awe. I realized though there’s a lot of mechanism involved, it wasn’t a piece of cake at all. All my years of inquistiveness transpired to salutation for the extreme precision and relentless efforts that go in during each trip made. Yet each day they wake up with the same enthusiasm to battle the odds. This spirit is what inspires me to be #ReadyforAnything. After getting IAS topper, introducing her father to people @ Silchar. The grand salute to her and her father. ← Fake TV screenshot with a quote by Sambit Patra which he never actually said.